Orlando, FL (January 28, 2019) - Over the weekend, Correct Craft and Nautique employees served to provide hurricane relief to the local community in Florida’s panhandle. Hurricane Michael was the first category 4 storm to make landfall in Florida’s panhandle. Correct Craft and Nautique employees helped clean up the hurricane’s debris and made repairs to homes in the community impacted. The team also donated cleaning supplies, clothing and medicine to impacted locals. 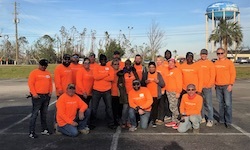 Bill Yeargin, Correct Craft’s President and CEO, who joined the team on this service trip, stated, “With all the news about the devasting damage from Hurricane Michael, our team was eager to help those impacted get back on their feet. While the news media has moved on to other stories, there are still many people suffering in our home state.” Yeargin added, “Our team worked hard to help Hurricane Michael’s victims as we have served people all around the world. Service is an important part of our culture and we were happy to help our fellow Floridians suffering from the effects of this devastating hurricane. About Correct Craft: Celebrating 94 years of excellence in the marine industry, Correct Craft is a Florida-based company with global operations. The Correct Craft family includes Nautique, Centurion, Supreme, Bass Cat, Yar-Craft, SeaArk, and Bryant boat companies, Pleasurecraft Marine Engine Group, Watershed Innovation and Aktion Parks. For more information please visit www.correctcraft.com.